This page deals with the problems of setting up a radio station. Our (MAX) kits will be used as an example, although others could be used as well. First you need to establish what kind of an area do you want to cover. There is no difference in range between transmitters of different manufacturers, provided they're operating at the same power level. The difference can show in audio quality, reliability, life span and spurious emissions. First, we have provided a number of prepared combo packages for you, explaining and containing everything you need to start broadcasting immediately. These complete packages can be reviewed here. - If you just want to cover your property (house, apartment, yard), think about PCI MAX. This transmitter is a PC card, you insert it into your PC (just like any other computer board) and it turns your PC into a FM radio station. - If you want a higher quality stand alone solution, think about our boxed standalone transmitters: Cyber MAX LCD or Cyber MAX FM. You can still use PC as audio source for these transmitters. - Even cheaper are our FM exciter boards (mono and with no enclosure). They are assembled or in a KIT form. They can be upgraded to stereo with any of our stereo encoders. 2.) Antenna. PCI MAX comes with a rudimentary small handy antenna. All others require a special antenna. Antenna needs to be placed as high as possible, preferably on a roof or a highly elevated tower. Several types of antenna exist, some radiate in all directions, others are more or less directional. Check our antenna guide. 3.) 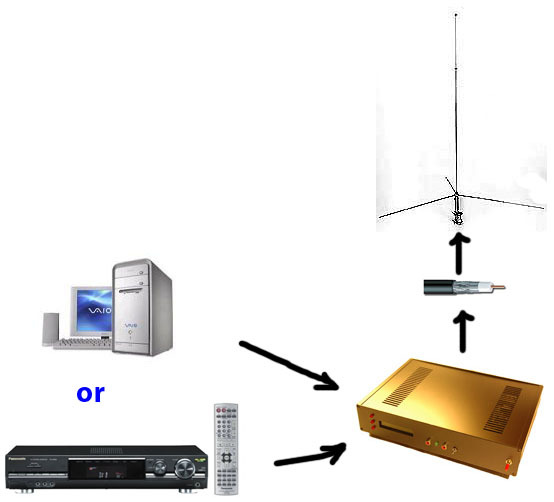 Coaxial cable transfers the energy from your transmitter to the antenna. RG-58 and RG-213 can be used, with RG-213 being better. They can be purchased at our website under accesories on the left. BELDEN is the best, but its price is only justified for long runs of the cable. 4.) Power supply. PCI MAX and Cyber MAX LCD do not require this as it comes built-in. Other units usually require mains power supply. 5.) Audio equipment. This can be a limiter & compressor, tape decks, mixing tables, cd players or even a PC. Note that it is not necessary to use PCI MAX in order to use your PC as audio source. In fact even professional radio station use PC's today to stream their audio. This is our most popular boxed unit. Probably for its simplicity and features at a great price. It has LCD display so it is easy to control frequency and use the unit. It also has a built-in power supply so no extra cables and boxes. Another strong point is the optional built-in RDS encoder (for US; This is a system which makes it possible to send text messages to your radio receiver). Its hard to beat this package on features and price. Price and features, optional RDS, built-in mains power supply, easy to handle and less cables. - Coaxial cable (50 ohm coaxial cable RG213, RG58 or Belden - best), keep it short, you can get it HERE. - SWR meter to tune your antenna (optional). See accesories on the left. Check out the remaining guide sections for additional information about antenna designs, power supplies, audio equipment and more. You can order everything discussed above by choosing an appropriate product category in the first selection box (Our products) in the frame on the left.